Meghan PIcerno is Christine in "Love Never Dies"
Now it’s 1907. He has moved to the United States and owns a Coney Island carnival show, Mr. Y’s Phantasma, in “Love Never Dies,” Andrew Lloyd Webber’s 2011 sequel to his musical megahit. While this North American touring production presented by Broadway San Jose lacks some of the elements that made “Phantom” so popular, it still has many aspects to enjoy. Chief among them are the spectacular scenic and design elements: gorgeous sets and costumes by Gabriela Tylesova, lighting by Nick Schlieper and sound by Mick Potter. Meghan Picerno as Christine Daaé, whom the Phantom loved and lost, has a bright, coloratura that easily reaches the stratospheric heights of her music. In this show, she has become a celebrity singer in Europe who is to sing in New York City. When the Phantom hears the news, he anonymously invites her and her family to visit Mr. Y’s Phantasma. 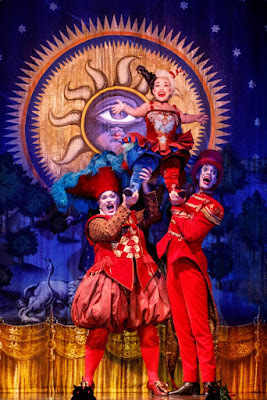 Her family includes her young son, Gustave (the cherubic-voiced Jake Heston Miller, alternating with Casey Lyons), and her husband, Raoul, Vicomte de Chagny (Sean Thompson, another fine singer), whom she had chosen over the Phantom. However, the marriage is in trouble because of his drinking and gambling. Other returning characters are Madame Giry (Karen Mason), who knew the Phantom’s background, and her daughter, Meg (Mary Michael Patterson). Madame Giry oversees his show while Meg is its star performer. Madame Giry sees Christine’s return as a threat. The plot boils down to two conflicts. The first is between the Phantom and Raoul for Christine’s love. 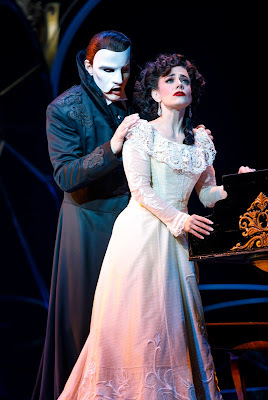 The second is between Christine’s faithfulness to her marriage and her still-strong attraction to the Phantom and his music. The outcome is surprising. While Lloyd Webber’s music (with lyrics by Glenn Slater and Charles Hart) may not be as memorable as his “Phantom” output, it’s still quite tuneful. It even picks up an occasional motif from “Phantom” just to remind us where it all started. However, Ben Elton’s book is based on “The Phantom of Manhattan” by Frederick Forsyth rather than a novel by Gaston Leroux. as Fleck and Stephen Petrovich as Gangle. As directed by Simon Phillips, the acting is first-rate by both the principals and the lesser characters. Mainly they are Gangle (Stephen Petrovich), Squelch (Richard Koons) and Fleck (Katrina Kemp), a tiny woman with a big personality. The large ensemble of singers and dancers also does well under musical director/conductor Dale Rieling and choreographer Graeme Murphy Ao. Running about two and half hours with one intermission, “Love Never Dies” will continue only through March 18 at the Center for the Performing Arts, 255 Almaden Blvd., San Jose. For tickets and information, call (800) 982-2787 or visit www.ticketmaster.com.